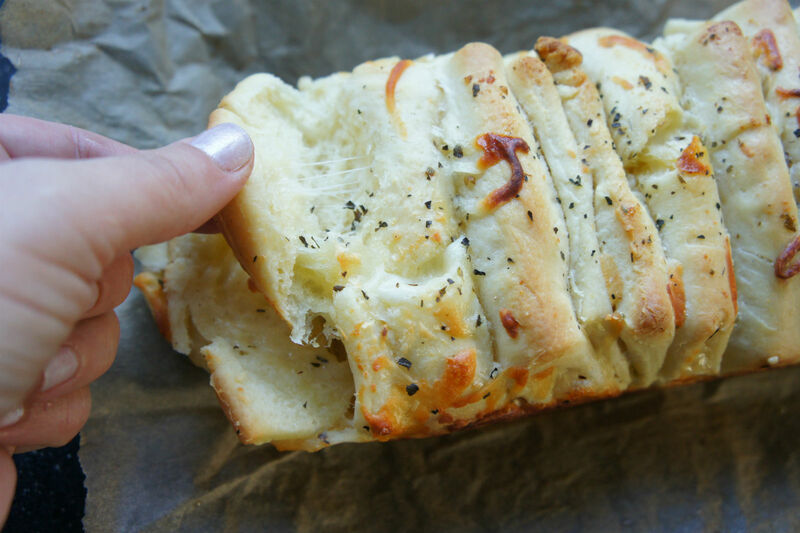 A savory mash-up bread that is totally addictive. Yes, babka is usually sweet: chocolate and cinnamon are the most traditional flavors, as we learned many years ago from Seinfeld and Elaine. To make the dough: Place the yeast and ½ teaspoon sugar in a small bowl. Add the lukewarm water and stir gently to mix. Set aside until foamy, 5 to 10 minutes. In a stand mixer fitted with a dough hook, mix together the flour and 1/4 cup sugar. In a medium saucepan, scald the milk (bring almost to a boil, until milk is just simmering). Allow to sit for 1 minute to cool just slightly (or just add cold milk — see note above). With mixer on low, add the water-yeast mixture, milk, and melted butter. Add eggs one at a time. 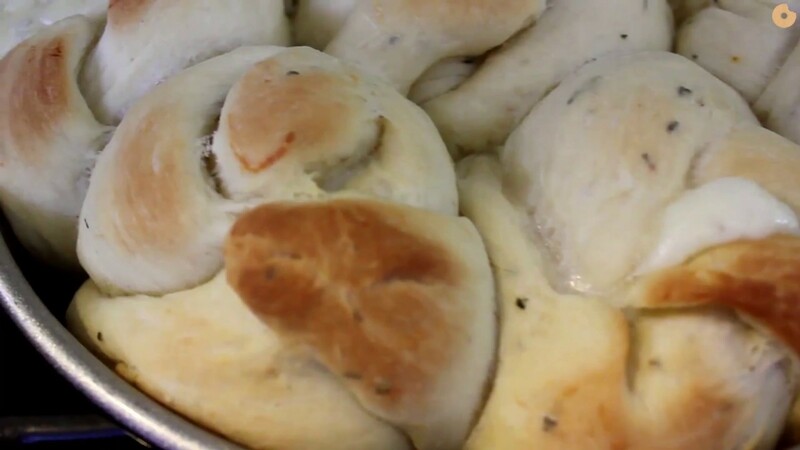 Place dough in a greased bowl with a damp towel on top. Allow to rise 1 to 2 hours. Prepare two 8 ½-by-4 ½ greased loaf pans. Cut the dough into two equal parts (use a food scale for precision). Set aside one half of the dough. Roll out the one piece of dough into a large rectangle. Using a pizza cutter or dough cutter, cut the dough down the middle lengthwise, then cut into approximately 3 inch squares. 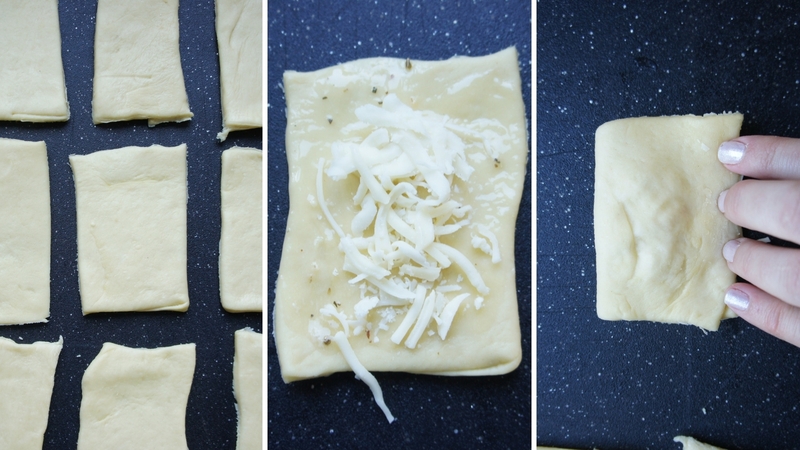 Roll each square until slightly elongated with a rolling pin. 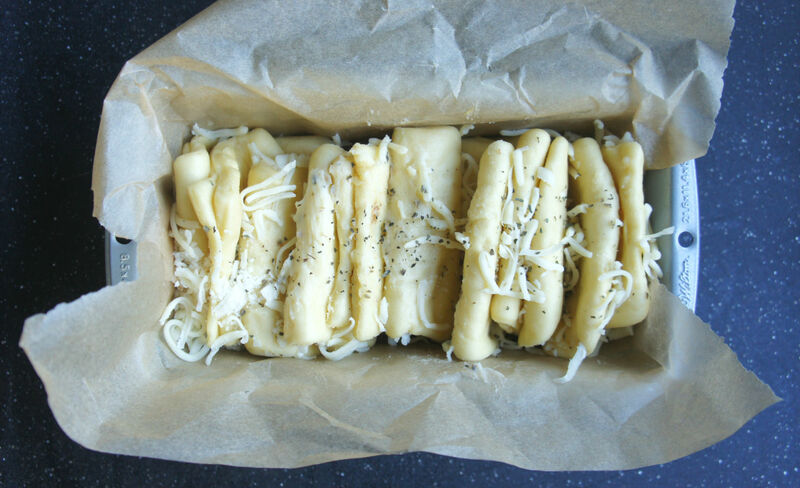 Brush each piece of dough with the garlic butter, then top with cheese. Fold into smaller squares/rectangles. Once all the pieces of dough are filled with butter and cheese, place in a greased loaf pan so they are standing up. You can alternate with seam on top and seam on the bottom. Lightly drape a kitchen towel over the top of pans. Allow to rise another 15-30 minutes. Preheat oven to 350°F while the dough rises. 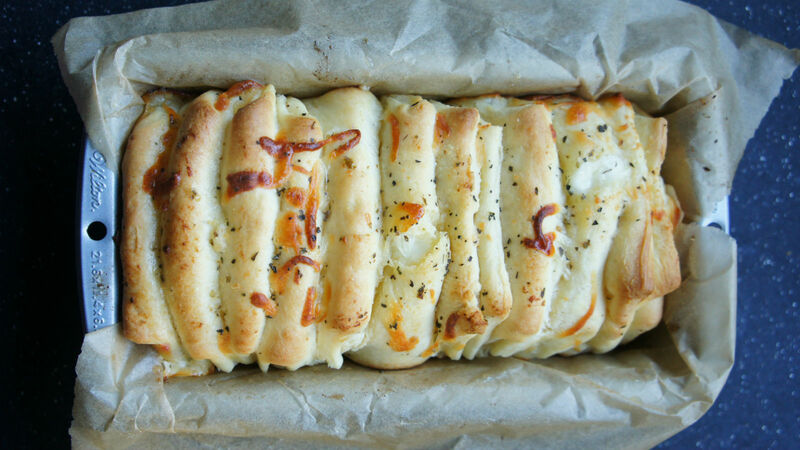 Top with any additional cheese. Bake for 30-35 minutes, until golden on top. Brush with remaining melted butter as soon as you remove from the oven. Serve warm with tomato sauce for dipping if desired. A summery Italian salad gives new life to day-old crusty bread.